A couple of months ago, while covering an art show at the Carnton Plantation, I was greatly impressed by the work of artist Josephine Getz. It was the night of the tornado that touched down in Franklin. The strong winds were blowing in, and I spotted a man swiftly moving some guitars away from the storm. 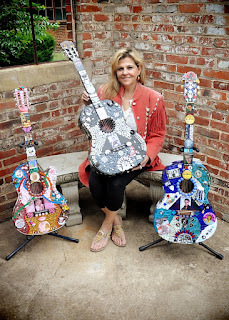 At second glance, I saw that the guitars were covered in beautiful mosaic tiles and adorned with photos and trinkets from some of the greats- Johnny Cash, Dolly Parton and Elvis just to name a few. The man was Josephine’s husband Gordon, and I quickly made a connection with this endearing couple. Josephine said she started expressing her talents through mosaics in 2001, after she accidentally broke a piece of her grandmother’s china. She said she wanted to make something beautiful out of the pieces so she glued them to an old mirror and loved the finished product. 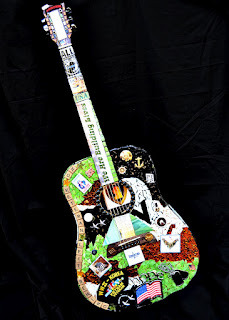 Moving to Nashville in June of 2011 inspired her mosaic work to evolve into the guitar art. She custom makes every guitar so that no two are alike. Each piece tells a story, which is illustrated through poetry by Josephine’s husband and included with the guitars. Josephine has aptly named her art “Stars on Guitars”. She describes her work as a labor of love, and I undoubtedly agree. She uses her talents to give to many local charities, and a portion of every sale is donated to The Bill Walter III Melanoma Research Fund. 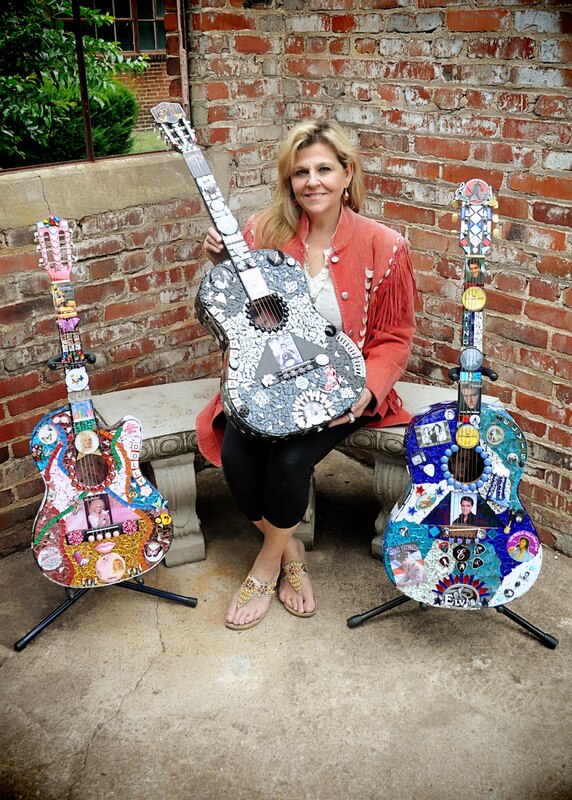 To promote her idea of using guitars as fundraisers, Josephine has created and given away several to stars, including Tim McGraw, Faith Hill, Carrie Underwood and Keith Urban. Her wish is for the stars to sign and auction off the guitars to fans so that they can give the money to charity. Her latest project is a custom guitar for We Are Building Lives, a non-profit organization dedicated to rescuing Nashville’s homeless veterans. Josephine has collaborated with Ira Blonder at Sound Kitchen to make this guitar (below) something really special. The guitar will be auctioned off at the 5th Annual Nashville Veteran’s Benefit on September 8th. I have become quite the fan of this artist and her remarkable work. I’ve been following her around to art events, where her guitars always steal the show. When I arrived at her tent in the Franklin Main Street Festival in April, I was so excited to see a much-deserved 1st Place in Fine Art ribbon displayed on one of the guitars. Recently, I connected Josephine with artist and Franklin business owner, Will Jordan, who says the guitars are “fantastic” and plans to put them in his new store Carpe Diem opening July 1st. I will definitely be there to support our local artists, and I hope you will join me! To find out more about Josephine and her “labor of love” go to www.starsonguitars.com.